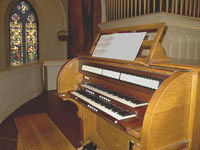 The following is an article written in November of 1987 on the occasion of the latest renovation of the organ by the incumbent organist at that time, Frank Gorton, Jr.
Francis of Assisi Church, California's first parish, was founded in 1849 and had already outgrown two buildings when the present structure's foundations were sunk in 1858. The cornerstone was laid October 2, 1859. The new church was of such size that its walls rose around and above the old building, which remained in use at ground level, until the new church was ready for use above. Just what musical instruments were employed these early years has not come down to us. 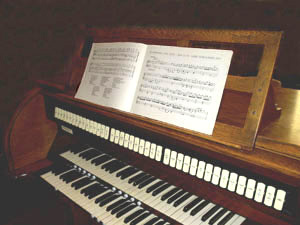 It is probable that an organ was rented from Joseph Mayer, San Francisco's pioneer organ builder. We do know that at the dedication of the new building, March 17, 1860, a choir of 150 singers, accompanied by an orchestra, assisted at the Mass and a Mr. Cramer presided at the organ. Not until the following November was Abraham Lincoln elected President of the United States. Furnishings for the new church were regularly acquired from 1860 to 1872. Probably in 1867, the parish bought a small two manual and pedal organ built by Mayer which he had previously rented to Grace Cathedral. In 1883, that organ was sold or given to St. Vincent's Church in Vallejo where it lasted until 1940. The Mayer organ was removed to make way for the largest instrument St. Francis was to ever enjoy. Built by John Bergstrom, another early San Francisco builder, the organ was of three manuals and pedals with perhaps 35 sets of pipes, nearly twice the size of our present instrument. It was further distinguished by having its music rack illumined by two gas jets. Our Bergstrom organ set standards for all of San Francisco. But on April 20, 1906, during the third day of the Great Fire, that stellar organ melted and burned with the rest of the church. It was to take years for the parish to rebuild; money was short. In 1906, as a temporary measure, a Lyon & Healy reed organ was purchased. It consisted of but one manual with three and a half sets of free reeds. There was no pedal keyboard because the organist had to use both feet to pump the wind supply. St. Francis made do with this tiny parlor organ for twenty years; the old instrument still sits modestly in a corner of the choir gallery. By 1926, when St. Francis could again afford a real organ, Schoenstein & Company of San Francisco installed a two manual and pedal organ of six sets of pipes, with chimes. Fr. 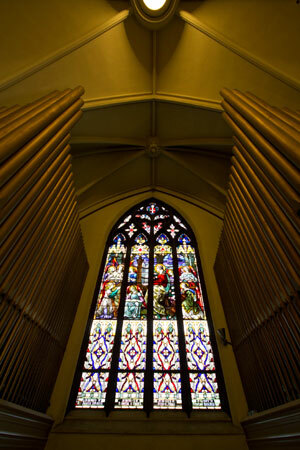 Patrick Collopy, the pastor, had arranged matters so that the organ (only at one sixth the size of the glorious burned Bergstrom organ) could be enlarged at some future date. Fire struck again on November 4, 1945. Through the firemen's efforts, the fire was restricted to the sacristy and the attic over the sanctuary. 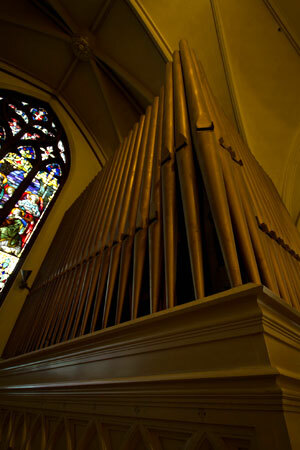 Though the organ was saved, the organist, Chester Farrell, lost all his music to water damage. After Vatican Council II, the sanctuary was rearranged. The choir was brought downstairs to be near the altar. 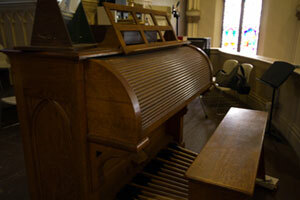 In 1971, again as a temporary measure, an electronic organ was purchased to accompany the downstairs choir. Like other electronic devices, this instrument soon began to fail and was finally removed in 1986. In 1978, Msgr. Robert Hayburn had already put into operation a far-sighted plan for St. Francis' future. The gallery organ was removed to the Schoenstein factory, rebuilt, enlarged and returned to the gallery in 1980 as a two manual and pedal organ of 17 sets of pipes with chimes, nearly three times the size of the 1926 installation. It is this splendid 1980 Schoenstein organ of 1,032 pipes that serves St. Francis of Assisi, today, November 22, 1987, and will service well into the future. Clarinet, Fifteenth, and Harmonic Flute, bringing the total number of ranks of pipes to 22, comprised of 1,301 pipes.